Excellent local with 9 beers on draught as well as a cider. Taster offered if you do not know your choice. A large selection of continental bottled beers, mainly Belgian. Would like a couple more non pale bitters as always, but fine pub all the same. The best pub I visited on my Christmas weekend in Norwich. Loads of good beers and no kegs to be seen. The locals and staff were friendly and knowledgeable, and the pub was busy - admittedly it was Christmas Eve, but I imagine trade is always good. This is a must-visit when in Norwich. Great beer selection and to their credit they use pint lined glasses so you get a full measure. Beer in good condition. Bar staff knowledgeable and enthusiatic. Bar billiards table which is a plus. Busy on my saturday afternoon visit. 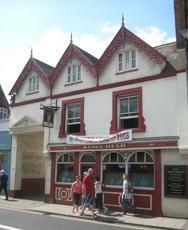 Very pleasant traditional beer drinker's pub, with good quality local beers (e.g. Grain) and lots of comfortable seating. Traditional local, worth a visit on a pub crawl or if in the area.